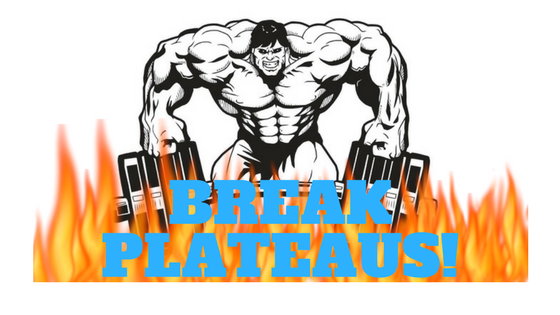 Everyone hates plateaus right? I do of course because I want more and more gains. Plateaus is a block, a barrier that prevents your body making anymore changes/gaining size/reducing/gaining muscle because overtime as we do the same routines for X amount of time, your body is adapted to those condition and you're now need to increase your workout in a new way/style. Your intensity must be a little more empowering. To maximize muscle growth, you need to tear down the muscle, break it down harder each in every day. Doing the same intense workouts won't progress you any further, you'll just be in 'shape' rather than building muscle. Not only does changing up the style help build muscle, it helps fight fat off more effectively. Time Under Tension - Always keep tension on the muscle that you're training for max results. (concentric | eccentric movement - Lift Slow on the way UP, slow on the way Down, Fast on the way Up, Slow on the Way Down). Change the way you lift, feel the connection with the different angles you're lifting from, train with different variety to increase the pump. Pause reps - Pausing within your lift/workout is similar to Time under Tension. You're pausing basically in the middle where the muscle contracts the most to provide a blood rush into that area for a huge PumP. Partials - Partials are what it means, doing half-reps. Doing half reps is going to activate more fibers (= more gains). Do this when failure hits. Drop Sets - Using the weight you started off from and dropping the weight slowly to further the training of that muscle. Example: 40 LB dumbell bicep curls x 8 -- Hits failure and Drops weight Lb to 20 LB and Rep out and Drop weight and repeat. These are the techniques that I use personally to help increase the intensity of my workout to break plateaus. Basically, you need to have variety of styles within your workout regime. If not, your body will adapt. You need to confuse the body (Shocking the body) with new exercises.